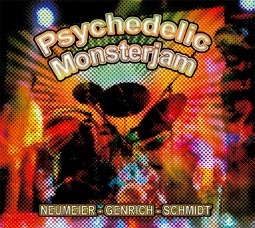 Psychedelic Monster Jam - "Neumier-Genrich-Schmidt"
This CD is taken from two concerts performed in 2003 with Dave Schmidt (Zone Six, Sula Bassana, Ex-Liquid Visions) on bass and original Guru Guru members, Ax Genrich on Guitar and Mani Neumeier on drums. This was the first time that Ax and Mani had played together in 30 years. Dave, who has played in bands that do a lot of improvisation, was ready to play with these guys. The set features three old Guru Guru songs and the rest is completely improvised. The CD begins with "Bong", a good old fashioned 70’s acid jam, and this leads into the really cool "(Do you want to) Boogie in Bombay". This tracks starts with a lot of spaced out sounds and mixed percussion before the real groove develops. Awesome stuff. "Stone In", an old Guru Guru number, is a heavy psychedelic acid guitar freakout! This leads into "Stone Out" and really captures that feeling of the old recordings of Guru Guru from '70-'71. "Moonlight Flight" is a total improvisation and it meanders a bit but the bass line is really cool and solid and gives the others space to go where no one has gone before. Another Guru Guru track, "Next Time, See you at the Dalai Lhama". I like the way this track develops and Ax really plays some freaky psychedelic guitar. "Rising Sun" is a mellow track with just bass and drums and Mani playing bells. "Electric Junk", the last Guru Guru number and 18 minutes long, is pretty bluesy but slowly develops into a long guitar improv, including some spoken German by Mani. The CD ends with "Mushroom Moon" a laid back space journey. In all you get 80 minutes of pretty cool music totally in the spirit of early 70’s Krautrock. Some people will really dig this and get into while others will think that these guys are just making boring noodling. I think it is really cool stuff and we are lucky that someone recorded this so we could hear the magic when these three great musicians all met. I can’t wait for the next one. They have just done a small tour in Germany and all the gigs were recorded.